Mrs. Preeyaphan Piyaanun, joining to share their experience of the Small and Medium Enterprise Development Bank of Thailand (SME Bank), opened the seminar on ?? ?Strategy for African Markets Penetration? ?� to provide the bank?? ?s customer an understanding on exporting business with African countries. 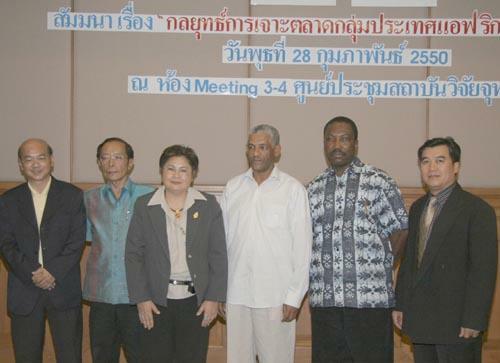 The seminar was presented by the expert from the Department of Export Promotion, Thai entrepreneurs who have successful exporting businesses in African countries, as well as businessmen from the Federal Democratic Republic of Ethiopia and the Republic of Ghana joining to share their experience, at Chulabhorn Research Institute Convention Center, February 28 2007.